Very cool review. Loved the bluntness and honesty. I reviewed an oregon pinot noir on my site recently - feel free to check it out. Very interested to read your review. I am an expat who actually has to drink what's locally available in Indonesia, living as I do in Surabaya, Java - one island along from Bali. Hatten's AGA White is perfectly palatable. It doesn't cloy and is refreshing. I do find the AGA Red rather underwhelming as your reviewer found. I just don't know that I am drinking wine with that one - it is flavorless. 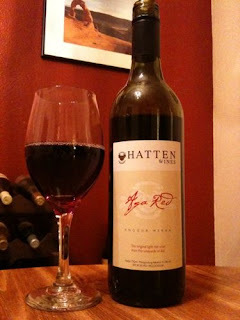 Hatten's Rose is a rather pleasant wine that perfectly suits a tropical life of hot weather and spicy food. Thank goodness for what we receive, I suppose. I drink the white and rose everyday and enjoy them. If they could crank up the fullness on the red I'd be quite happy. That's fascinating. Any recommendations of other Indonesian wines that perhaps have better offerings than Hatten? I have to admit that the only other wine I saw was from Wine of the Gods, but I didn't try it.